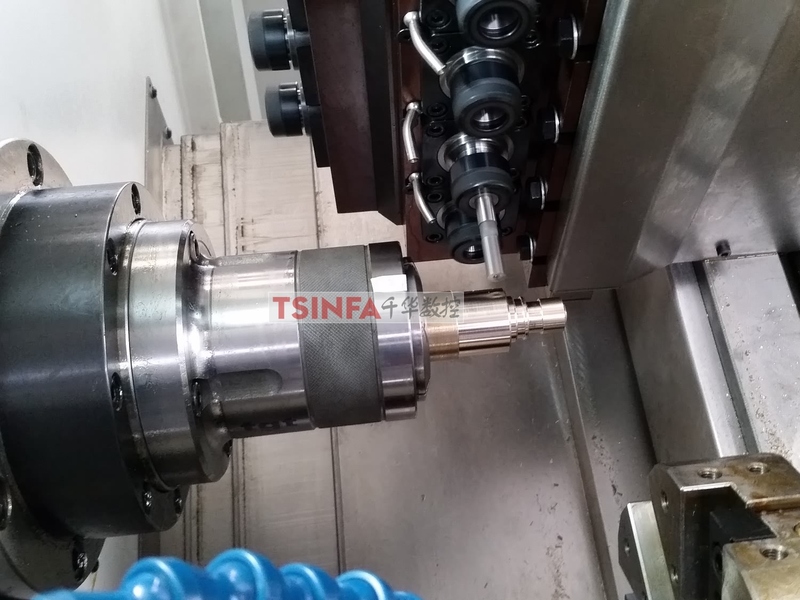 TFA-8S cnc turn milling combo machine can be used for a variety of workpiece, such as the shaft, plate and other parts of the outer circle, end face, thread turning, radial and axial various surface milling, drilling and other processing processes, suitable for small parts of the efficient processing and manufacturing. X, Y, Z, C axis Servo-control semi-closed loop type oblique bed Machine milling complex, the structure and dimensions of compact and reasonable, spindle (c axis) for servo motor drive. ● It can be equipped with automatic up and down material, has high processing efficiency. The whole base, sliding seat, supporting plate, spindle box and other major basic components are the use of high rigidity cast iron structure, in the base of the internal distribution of reinforcement, through a number of procedures to eliminate stress, so that the base has a higher structural strength and stable dimensional accuracy. The sliding seat is a box type structure, which guarantees the high rigidity and flexural damping performance of the foundation parts, and the base part adopts the resin sand molding and the aging treatment to ensure the stability of the machine tool’s long-term use accuracy, which provides the guarantee for the stability of the machine tool performance. Adopt brand high speed, high precision, high rigidity spindle unit, axial and radial bearing capacity is strong, rotate speed is high, temperature rises small. Optional: Oil bath feeder, automatic feeding machine, feeder, Chip machine, manipulator, Taiwanhydraulic chuck.